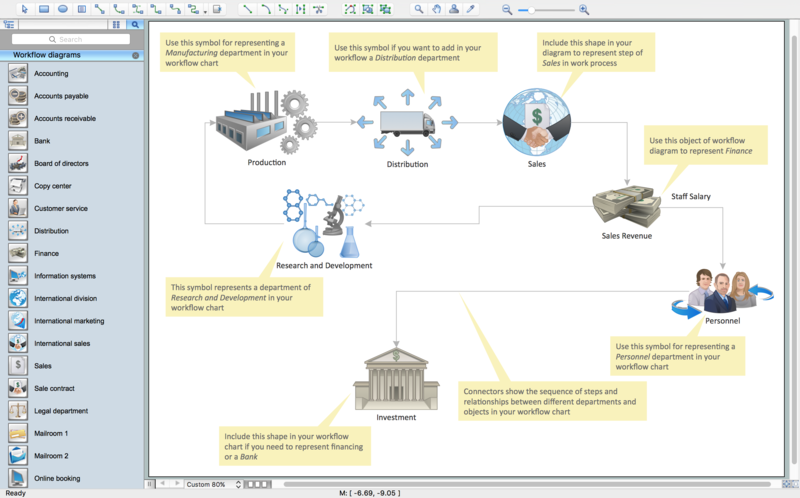 ConceptDraw DIAGRAM is simple workflow software for business process mapping. It extended with number of workflow tools alowing professionally create workflow diagrams,presentations and implement business process mapping. This is diagramming workflow tools for business process automation. A software you use for drawing workflow diagrams should provide a wide set of examples allows you get closer with workflow diagrams, learn symbols meaning, find appropriate layout and design, and then start drawing your own workflow diagram masterfully. ConceptDraw DIAGRAM software extended with the Workflow Diagram solution provides a complete set of samples, examples, templates and features help you to draw diagrams faster. This is excelent toolkit for preparing detailed business process automation diagrams and descriptions. 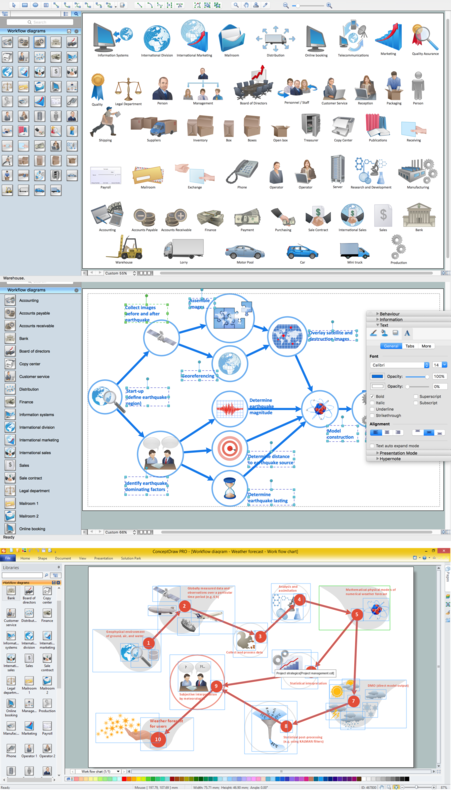 ConceptDraw DIAGRAM is a professional diagramming software for drawing business process mapping diagrams. It includes collection of workflow tools and flowchart symbols for bpm definition. The add on for this soft is the Workflow Diagrams solution that allow users to present business process modelling as compositon of data transferring, documents, and tasks during performance of a work process by using vector library objects and samples. They carry the simple entrance to workflow process diagram. 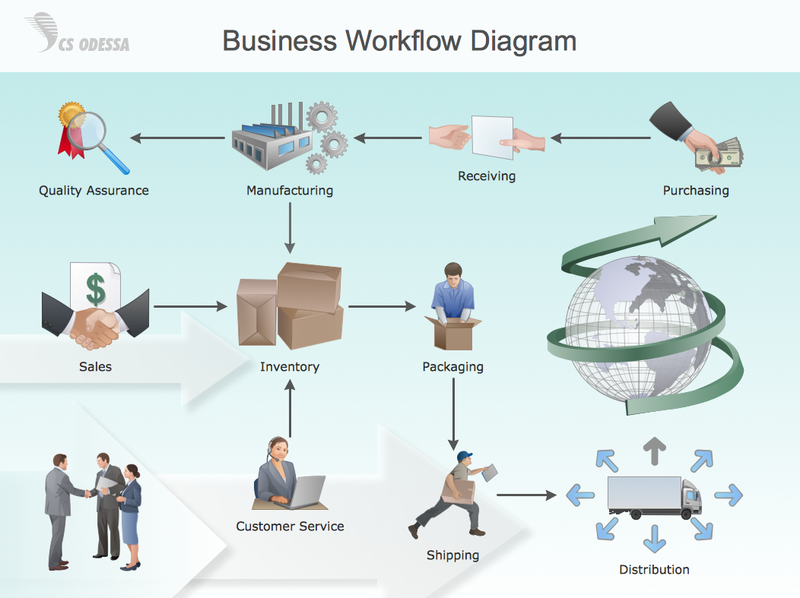 Pic.3 Workflow diagram example: Business process mapping. A Storage area network (SAN) is a dedicated network that provides access to data storage and operations only on the block level. SAN usually has own network of storage devices/elements and disk arrays that are connected with each other and to a remote data-sharing network. SANs are widely used for enhancing the storage devices (optical jukeboxes, disk arrays, tape libraries) that are accessible for networked servers. This example was created in ConceptDraw DIAGRAM v12 using the Computer and Networks Area of ConceptDraw Solution Park. It shows the hybrid of Storage area network (SAN) and Network Attached Storage (NAS) technologies.